Canyon North real estate is one of the most sought-after real estate markets in the Palm Springs area Real Estate. This prestigious golf course address is located in the canyon area of the south end of Palm Springs and is a well-established neighborhood offering many fine contemporary and stately homes. Canyon North real estate offers fabulous Hollywood Regency-style homes with a few gorgeous modern-style homes as well. The architecture in these classic Palm Springs homes is sensational as are the breathtaking mountain and fairway views. If you love golf and everything associated with it along with the prestige associated with Canyon North real estate, now is the time to check out what the Canyon North community has to offer. Situated near the Palm Springs National Golf course, formerly the Canyon Country Club, Canyon North real estate offers everything a golf lover needs. Located just minutes from downtown Palm Springs, after a day on the golf course, a night on the town is just a short drive away. You can also enjoy a great day of Golf nearby, at the Indian Canyons Golf Resort. The Canyon North area boasts visits by two presidents and first ladies, John and Jackie Kennedy vacationed in the neighborhood and Ronald and Nancy Reagan spent a weekend here in the home of Chuck Connors. The Palm Springs National Golf course offers a variety of membership options, a unique atmosphere, excellent cuisine, and breathtaking beauty featuring a historic centerpiece, the Walt Disney Fountain. 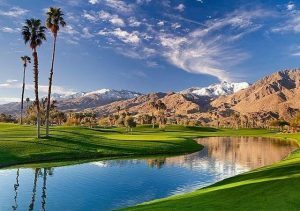 Not only does Canyon North in South Palm Springs offer nature lovers a panoramic view of the surrounding natural beauty of the mountains, desert valley, and fairways, it is located within walking distance of the Indian Canyon trails. The Indian Canyon trails offer a tranquil setting in a lush desert oasis filled with unusual rock formations, waterfalls and skirted palms that give the hiker a glimpse into the life of the Agua Caliente Cahuilla Indians that lived in the area. If you are a golf lover who has been searching for a prestigious address located at the edge of one of America’s premiere golf courses? North Canyon real estate is a beautiful mixture of architecture offering astounding views of the San Jacinto Mountains ad is just a short walk away from the natural beauty of the desert surroundings. Contact us today and we will help you find the home of your dreams with views of the golf course views and spectacular mountain views as well. Take advantage of the peace and serenity that North Canyon real estate offers. If you would like to see property at Canyon North in South Palm Springs, please call us at the numbers below. Were committed to helping you find the luxury home of your dreams.